The 10 Best Sushi Restaurants in Michigan! In restaurants across Michigan, sushi chefs prepare delicately-crafted and creatively-presented rolls at top-notch restaurants. 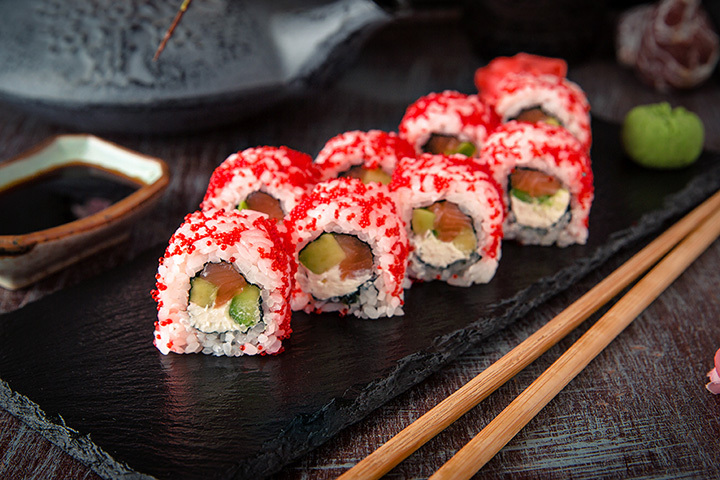 So, if you find yourself in the Great Lake State with a sushi craving, why not try out a meal prepared unlike any other? Check out one (or more!) of these 10 excellent sushi restaurants in the state. When you're rated No. 1 on Detroit's CityVoter study—and you're not even in Detroit proper—you know you've got some really impressive sushi on hand. That's just the conclusion that Sushi Zen in Brighton has reached, with its voters considering it top-notch not just for the sushi, but also for the atmosphere. Throw in the fact that it's won “Best Sushi” twice (and second place in 2013) and Sushi Zen will clearly deliver. One of the best Ann Arbor can offer, Sushi Town is found in one of the most unlikely of places—right next to a hardware store—but it's delivering some really impressive options. Perhaps the best point of Sushi Town is its sheer value. Free miso soup and green tea/water with takeout orders are an important part of the picture, as are the number of value-priced combination plates that deliver plenty of sushi for not too much cash. For East Lansing sushi buffs, the stop of choice is Sansu, a choice that seems to have pushed toward the collegiate types with a fervor unmatched in the area. Start with an array of sushi rolls as well as noodles, salad, and complete lunch and dinner options for diners to choose from, and throw in a special deal that features 20 percent off every Tuesday evening with a valid student ID, and that's enough to make Sansu a major stop for those craving sushi. Swing a little south to hit Battle Creek, and try your hand at Ichimi Sushi. Featuring complimentary edamame, from some reports, and the best five-word combination in sushi around “good sushi at good prices,” and the end result is a powerhouse sushi bar regarded by many as Battle Creek's best. Make note also of the décor, a simple Japanese restaurant affair coupled with a jazz soundtrack to make this not just a great place to find sushi, but to enjoy the experience. Follow I-94 and strike out north for Lucky Tea & Sushi Cafe in Grand Haven for another of Michigan's leaders on the sushi front. Featuring a lunch special that runs through the afternoon and parts of the morning besides—if you're having lunch at 10:30 a.m., you must work strange hours—there's a staggering array of options here. Naturally, there are sushi rolls, and plenty of them, but diners can also switch to full dinner options as well. Throw in free miso soup and a house salad with all entrees and the end result is a great package for anyone hungry for sushi. Would it shock you to reveal that the Upper Peninsula has some of Michigan's greatest sushi? It shouldn't. But if it does, take a trip on in to Sault Ste. Marie for Fuji Japanese Steak House and Sushi, home to some really impressive sushi rolls. Order online if you're in the area for access to a takeout menu, and if you're part of a party that wants sushi but you want no part of it, try the hibachi options instead to make your night a lot better than it would have been. White on Rice in Traverse City has two great distinctions going for it: Not only does it offer some very exciting new options for sushi—including a complete sushi box featuring a service for 12—but it's also a food truck. Yes, it's sushi off a truck, and it's not a terrible idea! It's actually regarded as one of the best sushi options in Traverse City, and that's no mean feat. There's also a more static location, reports note, so whether you're enjoying Michigan's more temperate weather or stopping in at the off season, you're covered either way. Want some great sushi in Saginaw? Stop into local favorite Sushi'n Others, home of sushi rolls, vegetarian fare and dinner options sufficient to make just abut anyone happy. Throw in some noteworthy roll combinations including a 15-piece combination plate and the variety alone makes this a champ. Its location only makes a better proposition. The Huron Athletic Club in Port Huron is widely regarded as the only good source for sushi in Port Huron without driving into Canada itself. That gives it something of a distinction in the area, and when you consider what all is on hand at the Huron Athletic Club, it only gets better from there. Not only can you get sushi in a variety of rolls, but you can also land some burgers while you're there, opening up the fullest range of options for diners. We started out around Detroit, and so we end around Detroit as well with the sushi option known as Noble Fish in Clawson. Regarded by Thrillist as the place to go for sushi in metro Detroit thanks to a combination of authentic décor and 30 different made-fresh-today sushi boxes that are available on a grab-and-go basis, it's hard not to approve of Noble Fish's sheer range and capability. Just to round it out, Noble Fish even offers a complete Japanese supermarket connected to it so you can take home your choice of Japanese delicacies as well as eat in.